Ocean Craft Marine drew unprecedented interest from European coastguards, navies, special forces and marine industry leaders, following an invitation to address international delegates attending the High Speed Boat Operations (HSBO) Forum in Goteborg, Sweden last week. The biennial global industry conference attracts high ranking officials from the world’s navies, coast guards, police, sea rescue, special forces, scientists and industry experts. On the invitation of the organisers of this key summit, Roy Nouhra, founder and President of OCM , addressed more than 300 delegates on innovative solutions offered by amphibious vehicles manufactured by Ocean Craft Marine. The technical presentation which highlighted solutions to previously unmet challenges and needs for government, military and commercial enterprises generated immediate interest and follow up from delegates. There are common requirements around the world, such as shallow water access and uncharted terrain that requires craft with minimal draft, easy beaching capabilities and single handed launch and recovery without a slipway. OCM boats are able to meet all requirements and more. 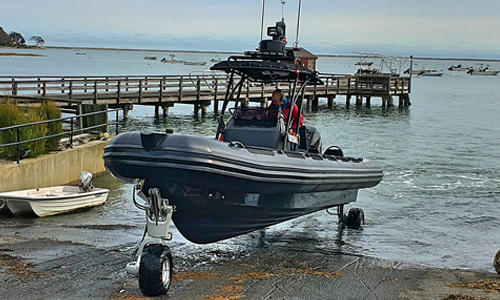 A high-performance, high-capacity boat constructed with a solid, shaped hull and flexible tubes at the gunwale, the OCM amphibious craft is powered by Sealegs® amphibious systems which consist of motorized, retractable and steerable wheels that enable easy deployment from water to land and back to water without the need for a ramp. Commenting on the exceptional reception received, Roy Nouhra said: “There is no doubt that OCM Boats go where few have been or will go any time soon, but it was gratifying and exciting to receive such serious interest from global end users at the highest level. Founded in 2006 by Roy Nouhra, OCM provides a turnkey service that assumes full control of every element of design, manufacture, delivery, training and after sales service. This enables the company to incorporate specific design details and customised options to create a craft that perfectly meets a client’s requirements, and deliver the finish product in a faster time than any other manufacturer in the world. The company currently provides customized support and surveillance craft for navies, coastguard, anti-piracy, security and riverine patrols for military and special forces in the US, Europe, Africa, the Far East, South America and the Middle East. 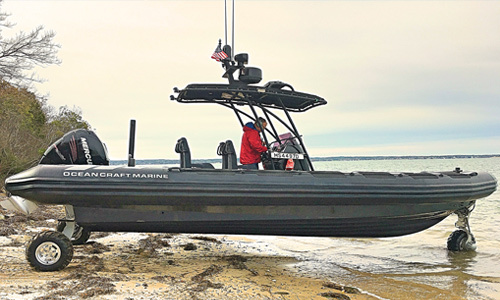 One of the few manufacturers in the world to gain US Coastguard Sub-Chapter T approval, OCM Boats are unparallel in their speed, maneuverability, seaworthiness, safety and stability in the most adverse conditions, in all climates and at the highest speeds. Manufactured using the highest quality materials, OCM Boats are strong, wear resistant, waterproof and immune to sunlight, ozone fuel, acids, oils and contaminants. “We use Hypalon™ in the manufacture of our sponsons or inflatable tubes because it is a top-of-the-range multi-layered fabric that is far superior to the standard PVC. And, of course, we have the capability to make them bulletproof too,” said Nouhra. Manufactured in a facility that has earned ISO 9001 certification, OCM craft undergo rigorous testing in harsh conditions to ensure compliance with the highest level international ratings for their products and process. All products enjoy European CE approval, as well as US certification from NMMA, SOLAS and ABYC bodies. “The interest that OCM Boats generated at HSBO Forum was specifically sparked by our ability to not only create a craft for almost any situation, but also because we understand the importance of efficiencies-we know that if we make sure our craft have the best shock-absorbing capabilities, are stable, yet powerful in challenging conditions and we incorporate noise-reducing elements, then the crews manning the craft will be more alert and competent for longer periods,” said Nouhra.